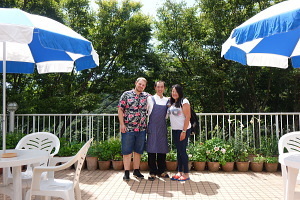 Thank you for staying in Shirahama and Pension Sakuraya. You can click these small pictures to see the larger one. If you need the original picture please let us know by e-mail. 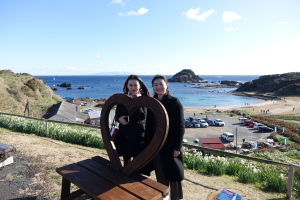 They are beautiful ladies from China and have lived in Tokyo since 3 years ago, but it was the 1st time to come to Izu peninsula. They went to Mt. Omuro and Izu Shaboten Zoo before coming to Shimoda and they went to the nearest beach and Shirahama shrine after check out. 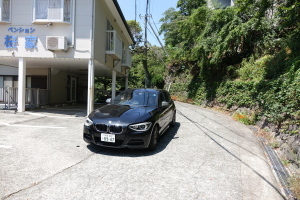 After that, as they were going to Tsumekizaki cape I took them by my car because I had to go to Shimoda for shopping. 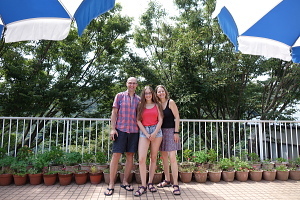 They came to Japan from Canada for the 3rd time and stayed with us for two nights..
Actually their son lives in Numazu city with his wife, so they come to Japan and stay at their son’s house. 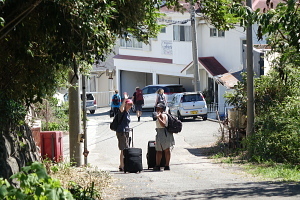 During their stay they went to the nearest beach and walked in and around Shimoda city. And they went to Izu Kogen after check out. 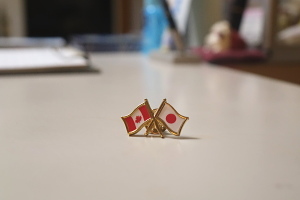 P.S They gave us the friendship pin badge of Canada and Japan. Thank you so much for the present. They came from Taiwan and stayed with us for one night.. 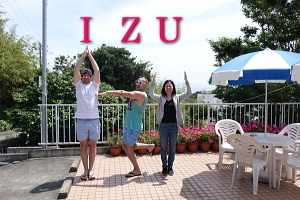 They have visited Japan every year since 9 years ago, but it was the 1st time to come to Izu peninsula. 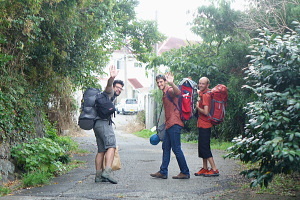 They stayed in Ito city and Shuzenji before coming to Shimoda and will stay in Tokyo for 2 nights before leaving Japan. 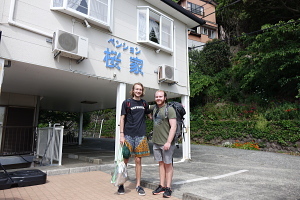 It was the 3rd time for them to come to Japan, but they came to Izu peninsula for the 1st time and stayed at Pension Sakuraya for 3 nights. 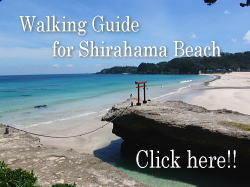 During their stay they went to the nearest beach, walked on Suzaki walking trail and around Shimoda town. 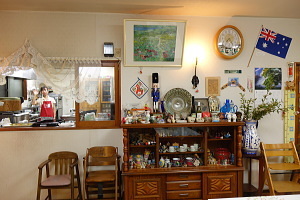 After they checked out they went to Toi on the western side of Izu peninsula. 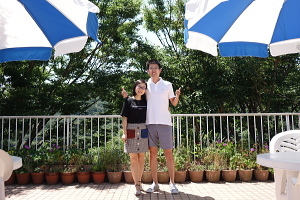 They came from China and stayed at Pension Sakuraya for 2 nights. 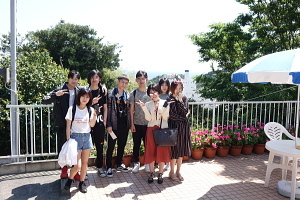 During their stay they went to the nearest beach, and went to Shimoda city to get on the Shimoda bay cruising and the cable car. I took them to the station by my car after they checked out because I had to go to Shimoda for shopping. See you again someday in the future! 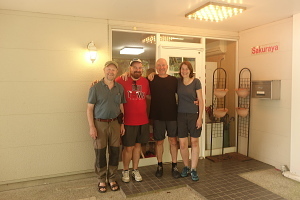 They came from Germany and stayed at Pension Sakuraya for 3 nights. 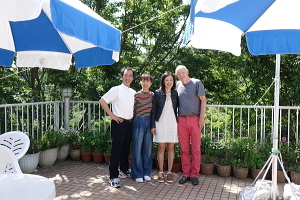 One of them, she has stayed with us long time ago when she came to Japan for her buisiness as a staff of Bärenreiter which is one of the largest world wide publishers of classical music scores. At the same time we, members of chorus group were practicing Mozart with this company's score by accident. I was surprised very much and took here to the leaders of our chorus group to meet them. 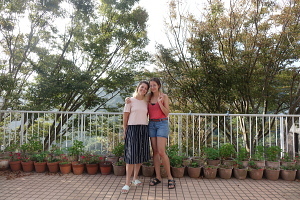 And this time she came to Shimoda with her husband and her friends after 9 years! 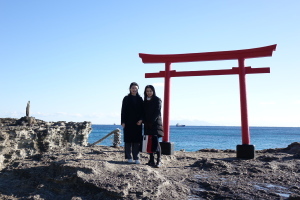 During their stay they went to the beach, walked in and around Shirahama and Shimoda city. We were very happy to have great time with you. See you again someday in the future. 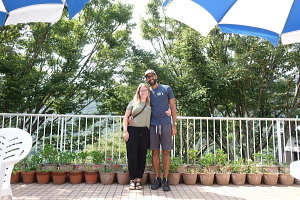 They came from Holland to Japan for the 1st time and are traveling for 3 weeks. Before they came to Shimoda the typhoon passed near Izu peninsula, so we had been worrying about them. But they came to Shimoda safety. During their stay they went to the beach, but there were a lot of driftwood and seaweeds on the beach and the water was cloudy. We are very sorry, but we wanted show them the clear and blue sea. They went to Fuji lakes, Nara, Kyoto and Hiroshima after Shimoda. Have fun and nice holidays in Japan! 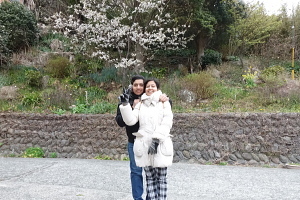 They came from the United States to Japan for 2 weeks sightseeing for the 1st time. 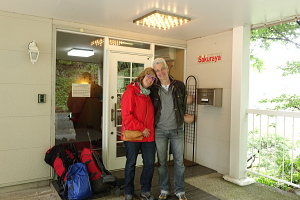 After their stay in Tokyo and Kyoto for several days they came to Shimoda and stayed at Pension Sakuraya for 3 nights. During their stay it had been sunny and they went to the beach everyday. 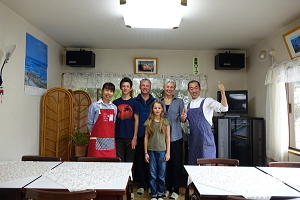 We were very happy to welcome them and to serve them dinner and breakfast. Come and visit Japan again in the future! 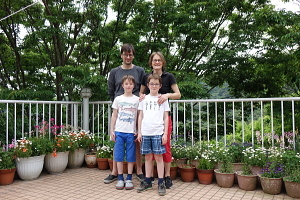 They are a family from Germany and came to Japan for the 1st time. After they arrived in Japan they drove to Nikko, Kawaguchiko, Nagoya and came to Shimoda. 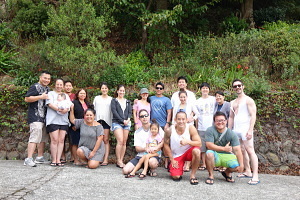 During their stay in Shimoda they went to the nearest beach to swim and Ebisujima island for snorkeling. They were so excited to see a lot of fishes in the water! After they checked out they went to Narita airport to return the rental car and are going to Kyushu by Shinkansen. Have a nice holiday and a great journey in Japan! They are from the United States and Canada. She has stayed with us 4 years ago, but it was the first time for him to visit Japan. 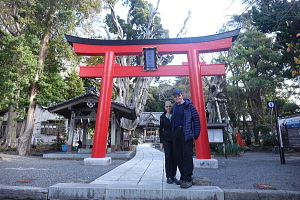 After she finished to teach history at American schools in Japan she traveled in Japan with him. As I had to go to Shimoda for shopping I took them to the station and took some pictures of them on the way and at the station. We are really looking forward to meeting you again. 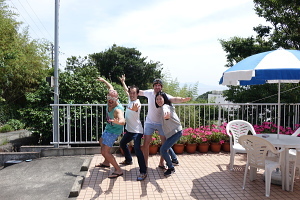 They are from England and Thailand and have visit Japan for several times before, but it was the first time to come to Shimoda. Actually they wanted to go to a lot of places in and around Shimoda, but they didn't have enough time. 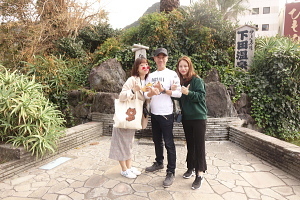 So they went to the cave in Toji district in Shimoda city on the 2nd day. It had been rainy during their staying in Shirahama, but it will be sunny tomorrow and the day after tomorrow. So they will go to the beach during their stay in Shimoda. They are a family from Indonesia and have lived in Japan since 11 years ago. 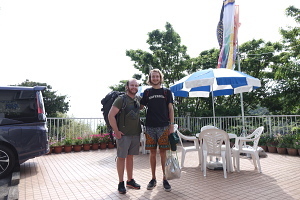 They stayed at Pension Sakuraya for one night and they were going to the cave in Shimoda after check out, but we are very sorry about the weather during their stay. We look forward to having you again. Please come to Shimoda with the sun! They are from China and have lived in Tokyo since 3 years ago. 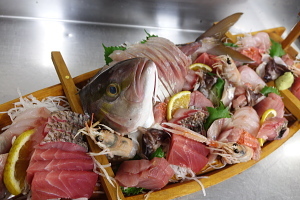 Before coming to Shimoda they had lunch in Odawara city and went to Atami and Jogasaki in Ito city. 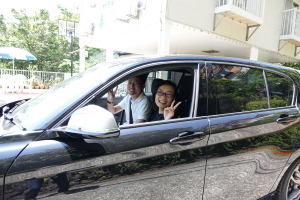 And they went to Southern tip of Izu peninsula and drove on Western side of Izu. I think they were lucky to have sunny days during their holidays in Izu peninsula. As they speak Japanese very well I had good communication with the. We are really looking forward to welcoming you again in the future! * Click the links below to get the original photos! 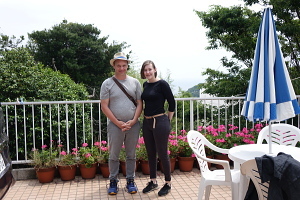 They are from Holland and Cyprus and have lived in Tokyo since 4 months ago, and it was the first time for them to come to Shimoda. On the 1st day, as we had no other guests we went to Shimoda harbor to see the fireworks display with them. 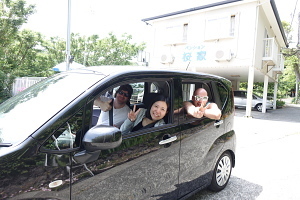 On the 2nd day they drove to Irozaki cape, Kimomi beach in Matsuzaki town and some other places. 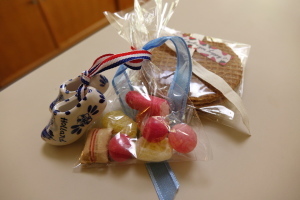 Thank you very much for staying with us and the present from you! They came to Japan from Germany for the 1st time. 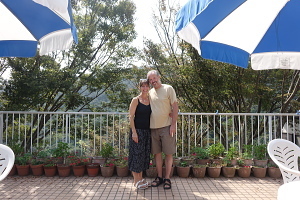 They stayed in Tokyo for several days and came to Shimoda, and stayed at Pension Sakuraya for 2 nights. 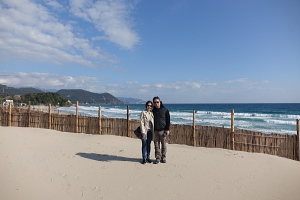 On the 2nd day they walked to Sotoura beach, Tsumekizaki cape and Suzaki on the coastline. 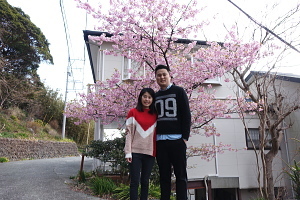 Before coming to Japan they went to Taiwan and stayed for 10 days, because their son is college student in Taiwan. After that, they arrived in Japane 1 day prior to their reservation date. They asked me to have making Soba (buckwheat noodle) experience before coming to Japan. 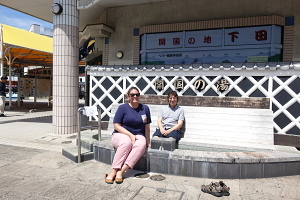 So we went to Kazono district in Shimoda for Soba making workshop together on the 2nd day. 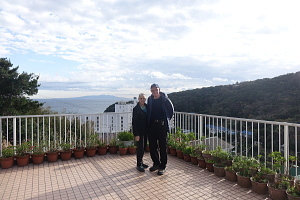 On the 3rd day they walked on the seaside road from Kisami beach to Yumigahama beach looking over the Izu seven islands under the beutiful sky. We had great time and good communications with you! 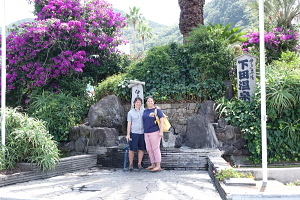 Before coming to Shimoda they went to Kyoto, Kamikochi, Nakatugawa and Matsumoto for 2 weeks. 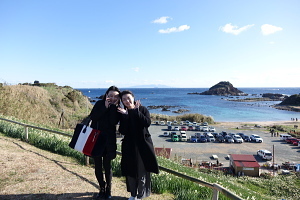 They love walking and hiking, so they went to Tsumekizaki cape by walking and took Suzaki walking trail to Ebisujima island on the 2nd day. 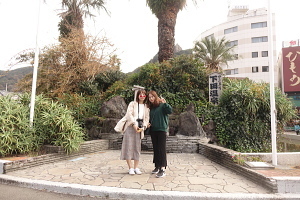 On the 3rd day they walked in Shimoda city and went to Shimoda aquarium. They are from China and live in Tokyo. 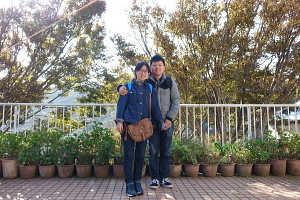 They met each other at the Japanese school, but they go to different universities now. They speak Japanese very well, they have lived in Japan for only several months though. They were lucky to have sunny days during their stay. They came to Japan for the 2nd time. They are traveling for 3 weeks and went to Kanazawa, Takayama, Miyajima, Nagasaki, Kagoshima, Yakushima island and some other places. 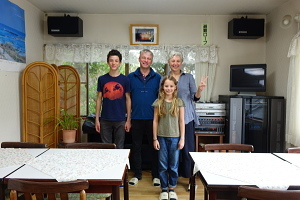 And they came to Shimoda from Kotohira in Kagawa prefecture and stayed with us for 3 nights. It had been almost sunny and went to the beach every day. I took them to the station by my car because I went to the station to pick my daughter up. 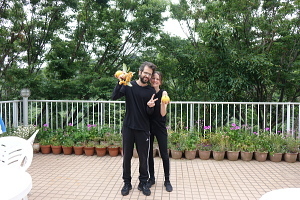 They are from Germany and have lived in Tokyo since 4 months ago. 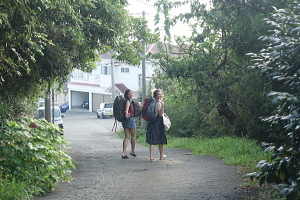 Before coming to Shimoda they went to Jogasaki walking trail in Ito city and stayed with us for 2 nights. 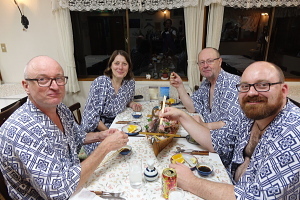 On 2nd day they went to the nearest beach Shirahama and went to the Japanese restaurant in Shimoda to eat Kinmedai! They are from India and have lived in Tokyo since 5 years ago. 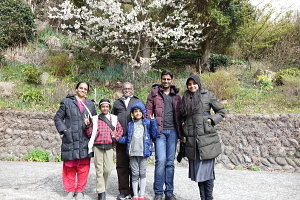 They came to Shimoda for the 1st time with their parents who visited Japan from India. 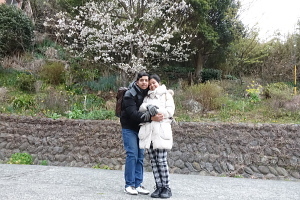 On the 1st day they went to Kawazu town to see cherry blossoms and Kawazu seven waterfalls, and went to Irozaki cape after check out. They are from Bangladesh and have lived in Shizuoka prefecture. It was the first time for them to come to Shimoda. We are very sorry but they didn't have good weather during their stay. hank you for staying with us. They are from China and came to Japan for the 1st time. 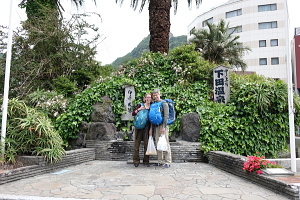 They are travelling in Japan for a week and stayed in Kamakura and Atagawa before coming to Shimoda. 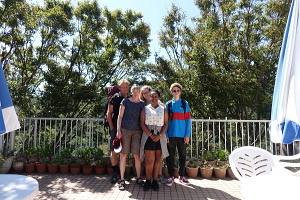 During they were staying in Kamakura unfortunately the typhoon ripped through Japan, but they were able to see the Mt. Fuji clearly after the typhoon passed away. They went to Tokyo after Shimoda and will leave Japan. 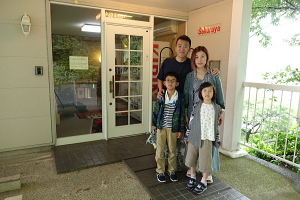 This family had been living in Yokohama since 4 years ago, but they are leaving Japan on October 22nd after their stay for 2 nights at Pension Sakuraya. 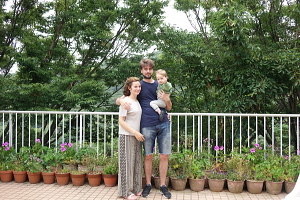 Actually they have stayed with us for the 1st time after living in Japan for 6 months, so it means it was the 2nd time and also the last time for us to welcome this family after 3 years and half. 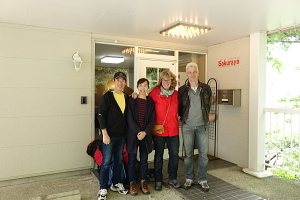 We appreciate that they chose our Pension Sakuraya for their last trip and stay in Japan. Thank you very much for staying with us and good memories from you. 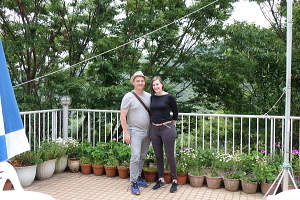 They came to Japan from France for the 1st time and stayed at Pension Sakuraya for 4 nights. During their stay they went to the nearest beach "Shirahama Ohama Beach" every day and played surfing. On the 4th day, as I didn't have any other customers I went to Ebisujima-island in Shimoda for snorkeling with them. I posted the pictures of them that I took at Ebisujima-island on Facebook album. I also had very good time with them for 5 days. When I took these pictures one of them had already checked out early in the morning, so actually they are 4 people. They are from Hawaii and live in Kanagawa Prefecture. They have stayed with us in last July, so it was the second time for us to welcome them and they stayed for 2 nights this year. We are very sorry, but they had strong north wind and rain during their stay. They went to Ryugu cave in Toji district and Seven water falls in Kawazu town after check out. We are really looking forward to meeting you on the fireworks day in next summer. 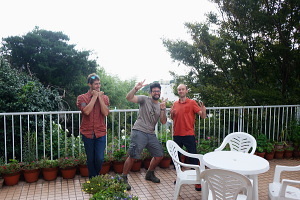 They came to Japan from France for the 1st time and stayed with us for 4 nights. During their stay it had been almost sunny and they went to the nearest beach every day. After they checked out they went to Kyoto. He is from Germany and she is from Peru, and they were married 3 years ago. But he has lived in Germany and she has lived in Japan for 3 years after they were married, so this trip was their honeymoon for the first time in last 3 years. They made a reservation for 2 nights from August 16th, but they appeared on August 15th, because they made a mistake of the reservation date. I thought it had been really hard to find the accommodation for August 15th because of Obon holidays, but I found it in Shimoda finally. 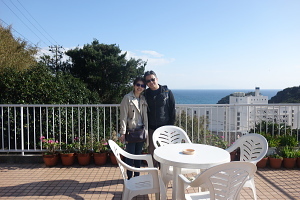 They spent one night in Shimoda and came to Sakuraya again next day, and stayed with us for 2 nights. We apprecitate that they chose our Pension for their honeymoon. Thank you very much for staying with us and see you again in the future!! At the end of August we got something delivered from this couple. 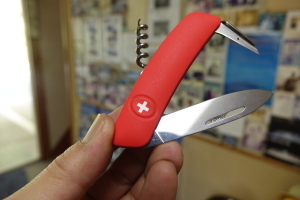 We were surprised that it was the big Nutcracker made in Germany. Thank you very much for your big present. It will be one of our best collection in the dining room! 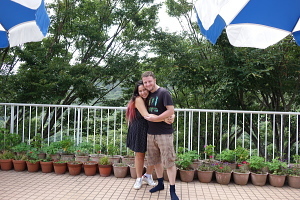 They came to Japan from Norway for the 1st time and stayed at Pension Sakuraya for 3 nights. During their stay they had good waves by typhoon and had fun with the waves on 2nd day and 3rd day. They went to Osaka Prefecture after check out. Thank you very much for staying. Please check the pictures of Beach, Plants and Nature in Izu.